Let me fill you in on the back story of how this project came about, combining my passion for the Siberian Huskies and photography. My love of the Siberian Husky began nearly 20 years ago when I decided it was the right time to get my own dog. Sitting down pondering through dog breed after dog breed, the loveable, independent thinking, energetic traits of the Siberian Husky kept reverberating with me. When I knew the Siberian Husky was the one, I connected with breeders to understand the breed better and to find out when a litter of puppies would become available. The first breeder we visited was Charline Wasson, and on meeting her found out she was the first person to bring Siberian Huskies to NZ in 1977, WOW! Charline was very generous with her time and gave us lots of information, insights, as well as grilling us to make sure we really knew what we would be getting into when owning a husky. This kind of questioning was repeated with all breeders we met at that time. Actually it was comforting to see that these people cared so much about the breed and also the puppies they we producing. On the 10th April 2001 a litter was born at Timberwolf Kennels in Waitara and from that litter we chose our girl Shadow. Life from then on was full of fur, fluff, more fur, more fluff, lots of exercise and always fun. . . . . .
My passion for photography is one that lay dormant for many, many, many years. Peeking out now and again throughout my life, yet until 2010 other priorities always pushed it aside. More details on that, see my About page. It was when I stopped playing squash (it was wearing my body out too quickly!!!) and needed to find a hobby to fill that void, the photography passion came to mind again. To fund my first DSLR camera we sold our original Canon AE1 SLR film camera and lenses and purchased a Canon 500D with an 18-55mm kit lens which became my constant companion. It went everywhere with me to take photos of whatever was around. Christmas 2010 saw a very generous Santa give me a 70-200mm f4 lens, allowing me to pursue my greatest love of animals, wildlife and action photography. 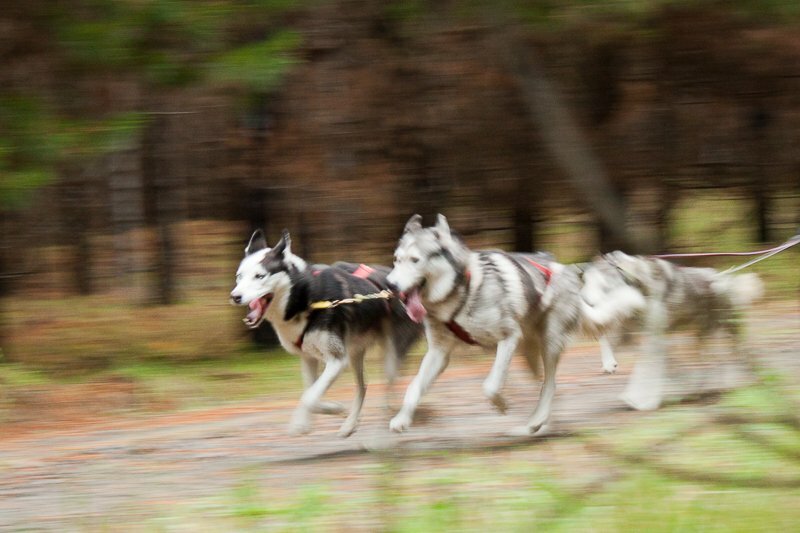 April 2011 was when the project idea first came to mind while we were attending one of the sled dog race meetings in the Waitarere Forest, near Levin. Shadow was with us and I was intent on taking photos of the action. 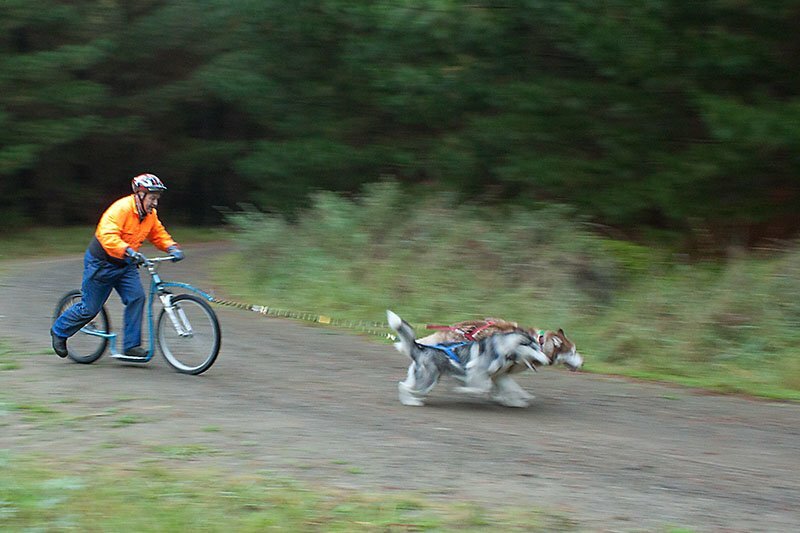 What I found out though, is that the forest environment and taking action shots of racing huskies hurtling along forest trails in low light, was very difficult indeed. I managed to get some reasonable photos (see below) yet not the clear, sharp action shots I was imagining. This brought home the realization to me that only having basic camera skills to do a project like this was way too big of an ask. I needed a lot more experience and knowledge in all things photography. Soooo . . . on the back-burner the idea went, fading into the background, although never completely dying out. My education continued through studying photography magazines, attending workshops, joining the Kapiti Coast Photographic Society (KCPS) and Photographic Society of NZ (PSNZ). With practice, patience and perseverance I began to learn the craft of photography and how to get the best from my camera. Always being open to trying any genre yet constantly drawn to wildlife, action and my love for birds. As my skills grew, so did my kit adding a 50mm f1.4 lens and 100-400mm f4 lens. Early last year I also upgraded my Canon body to the 7D MkII. Check out the Galleries on my website to see a selection of my work. Fast forward to 2016, and I find my work/life balance changing, with more time and the freedom to choose how I use it. The idea surfaces again and taking a big, deep breath I think, why not now!!! Even though my knowledge and skills have grown over the last 5 years, I recognise there is still a huge amount for me to learn and improve with my photography to achieve this dream, yet I am confident I have some solid basics to begin and grow through the adventure. It was in July last year, after taking that big deep breath, that I reached out to re-connect with those I knew in the Siberian Husky and Sled Dog Racing communities. My initial excitement just grew & grew. The more people I talked to, the more committed I became as everyone I spoke with was super positive about the project and going out of their way to help me pull it all off.